The Lenovo ThinkSystem NE2552E Flex Switch is an embedded switch module for Flex System that is designed for the data center to provide 10 Gb/25 Gb/50 Gb Ethernet server connectivity with 50 Gb/100 Gb Ethernet upstream links. It is an enterprise class Layer 2 and Layer 3 full featured switch that delivers line-rate, high-bandwidth switching, filtering, and traffic queuing without delaying data. Large data center-grade buffers help keep traffic moving, while the numerous high-availability software features help provide high availability for business sensitive traffic. This product guide provides essential pre-sales information on the ThinkSystem NE2552E Flex Switch, its key features and specifications, components and options, and configuration guidelines. This guide is intended for technical specialists, sales specialists, sales engineers, IT architects, and other IT professionals who want to learn more about the ThinkSystem NE2552E Flex Switch and consider its use in IT solutions. The Lenovo ThinkSystem NE2552E Flex Switch is an embedded switch module for Flex System that is designed for the data center to provide 10 Gb/25 Gb/50 Gb Ethernet server connectivity with 40 Gb/50 Gb/100 Gb Ethernet upstream links. It is an enterprise class Layer 2 and Layer 3 full featured switch that delivers line-rate, high-bandwidth switching, filtering, and traffic queuing without delaying data. Large data center-grade buffers help keep traffic moving, while the numerous high-availability software features help provide high availability for business sensitive traffic. The NE2552E Flex Switch has 28 internal ports that can be configured as 28x 10 GbE ports, 28x 25 GbE ports, 14x 50 GbE ports, or certain combinations of 10 GbE, 25 GbE, and 50 GbE ports. For external network connectivity, the NE2552E Flex Switch offers 8x SFP28/SFP+ ports that support 10 GbE SFP+ and 25 GbE SFP28 optical transceivers, active optical cables (AOCs), and direct attach copper (DAC) cables. The switch also offers 4x QSFP28 ports that support 100 GbE QSFP28 or 40 GbE QSFP+ optical transceivers, active optical cables (AOCs), and direct attach copper (DAC) cables. The QSFP28 ports can also be split out into two 50 GbE or four 25 GbE (for 100 GbE QSFP28), or four 10 GbE (for 40 GbE QSFP+) connections by using breakout cables. The NE2552E Flex Switch is ideal for hyperconverged and cloud solutions, as well as latency-sensitive applications, such as high-performance computing clusters and financial applications. The NE2552E RackSwitch is shown in the following figure. The NE2552E Flex Switch runs Enterprise Networking Operating System (ENOS), which is a data center-class NOS progressively developed over the past decade to deliver highly reliable, high-performance Ethernet and converged switching and interoperability with existing network infrastructures. ENOS has a feature-rich design with virtualization, high availability, and enterprise class Layer 2 and Layer 3 functionality. The NE2552E is cloud-ready with support for advanced NIC virtualization technologies, such as Unified Fabric Port (UFP). In addition, the switch offers different operational modes (from "easy connect" transparent networking connectivity to Layer 3 functionality) to satisfy diverse customer networking requirements. With support for Converged Enhanced Ethernet (CEE), the NE2552E can be used as an FCoE transit device and is ideal for network-attached storage (NAS) and iSCSI environments. The 10 Gb/25 Gb/50 Gb Ethernet NE2552E Flex Switch with 40 Gb/50 Gb/100 Gb Ethernet uplinks provides a combination of low latency, non-blocking line-rate switching, and ease of management. The embedded design of the NE2552E Flex Switch helps reduce data center air conditioning costs and power consumption. The NE2552E Flex Switch includes Layer 3 functionality, which provides security and performance benefits, as inter-VLAN traffic stays within the switch. This switch also provides the full range of Layer 3 protocols from static routes for technologies, such as Open Shortest Path First (OSPF) and Border Gateway Protocol (BGP) for enterprise customers. The NE2552E Flex Switch supports Converged Enhanced Ethernet (CEE) which helps enable customers to combine storage, messaging traffic, VoIP, video, and other data on a common data center lossless Ethernet infrastructure. As a result, customers can deploy a single server interface for multiple data types, which can simplify the deployment and management of server network connectivity while maintaining the high availability and robustness that is required for storage transactions. The NE2552E Flex Switch learns alternate routes automatically and performs faster convergence if there is a link or switch failure. The NE2552E Flex Switch performs seamlessly with other vendors' upstream switches. The NE2552E Flex Switch can help customers address I/O requirements for multiple NICs while reducing cost and complexity. By using Unified Fabric Port, customers can partition a physical NIC into multiple virtual ports (2 - 8 vPorts) and create a virtual pipe between the adapter and the switch for improved performance, availability, and security. Switch Partition (SPAR) allows clients to virtualize the switch with partitions that isolate communications for multi-tenancy environments. With a simple configuration change to "easy connect" mode, the NE2552E Flex Switch becomes a transparent network device that is invisible to the core and eliminates network administration concerns of Spanning Tree Protocol configuration and interoperability and VLAN assignments and avoids any possible loops. By emulating a host NIC to the data center core, it accelerates the provisioning of VMs by eliminating the need to configure the typical access switch parameters. The NE2552E Flex Switch integrates with Lenovo XClarity for centralized data center management. Integration with third-party automation, deployment, and monitoring tools, such as VMware vRealize Orchestrator and Log Insight, Ansible DevOps tools, and OpenStack cloud, provides rapid resource provisioning and simplified configuration management across the network. The front panel of the ThinkSystem NE2552E Flex Switch is shown in the following figure. 8x SFP28/SFP+ ports to attach SFP28/SFP+ transceivers, DAC cables, and AOCs for 25 Gb or 10 Gb Ethernet connections, or 100 Gb Ethernet connections by grouping 4x 25 GbE SFP28 ports into one 100 GbE port. 4x QSFP28/QSFP+ ports to attach QSFP28/QSFP+ transceivers, DAC cables, and AOCs for 100 Gb or 40 Gb Ethernet connections or breakout cables for 2x 50 Gb or 4x 25 Gb Ethernet connections out of a 100 GbE port or 4x 10 GbE connections out of a 40 GbE port. 1x RJ-45 10/100/1000 Mb Ethernet port for out-of-band management. 1x Mini-USB RS-232 console port that provides another means to configure the switch module. System LEDs that display the status of the switch module and the network. The following table lists the NE2552E system specifications. Note: The supported hardware options and software features listed in this product guide are based on the Lenovo Enterprise Networking Operating System (ENOS) version 8.4.8. Internal ports and external SFP+/SFP28 ports are combined into nine 4-port groups: INTA-INTB: 1-2, 3-4, 5-6, 7-8, 9-10, 11-12, and 13-14; EXT: 1-4 and 5-8. All ports in the same 4-port group operate at the same speed (10 Gbps, 25 Gbps, or 50 [2x 25] Gbps [internal ports only]). External port groups can be configured for 100 Gbps (4x 25 Gbps) operations. The switch can operate in any combination of up to three of five different port speeds supported (10 Gbps, 25 Gbps, 40 Gbps, 50 Gbps, and 100 Gbps) across all ports on the switch; a combination of four or five different port speeds is not supported. Layer 2 switching, Layer 3 switching, virtual local area networks (VLANs), VLAN tagging, spanning tree protocol (STP), link aggregation (trunk) groups (LAGs), virtual LAGs (vLAGs), Hot Links, Layer 2 failover, quality of service (QoS), Switch Partitioning (SPAR), IPv4/IPv6 management, IPv4/IPv6 routing, IPv4 virtual router redundancy protocol (VRRP), virtual NICs, Unified Fabric Port (UFP), Converged Enhanced Ethernet, Fibre Channel over Ethernet (FCoE) transit switch operations. Hot-swap parts SFP+/SFP28/QSFP+/QSFP28 transceivers, DAC cables, and AOCs. Management ports 2x 1 GbE internal ports connected to the chassis management module; 1x 10/100/1000 Mb Ethernet EXTM external port (RJ-45); 1x RS-232 external port (Mini-USB). Management interfaces Browser-based Interface (BBI); Industry-standard command line interface (ISCLI); SNMP; NETCONF (XML); Lenovo XClarity Administrator; Lenovo Networking Content Pack for VMware vRealize Log Insight; Lenovo Networking Neutron Plugin for OpenStack-based environments; Ansible support for IT automation. Security features Secure Shell (SSH); Secure Copy (SCP); Secure FTP (sFTP); user level security; LDAP/LDAPS, RADIUS, and TACACS+ authentication; access control lists (ACLs); port-based network access control (IEEE 802.1x). Warranty One-year customer-replaceable unit limited warranty. When installed in a supported chassis, the switch assumes the chassis’ base warranty and any warranty service upgrade; warranty includes Networking OS software upgrades. Mean Time Between Failures 300,000 hours MTBF with ambient operating temperature of 25° C (77° F). Weight 3.7 kg (8.1 lb). The following table lists the ordering information for the NE2552E switch. The switch is shipped with the Electronic Publications Flyer. QSFP28 and SFP+/SFP28 transceivers and cables are not included and should be ordered for the switch (see Transceivers and cables for details). A serial management cable is not included and should be ordered for the switch, if needed. The optional Cable Kit (90Y9338) contains mini-USB-to-RJ-45 and mini-USB-to-DB9 serial cables. For 10 GbE links, customers can use SFP28 ports with 10 GbE SFP+ direct-attached copper (DAC) cables for distances up to 7 meters or 10 GbE SFP+ active optical cables (AOCs) for distances up to 20 meters. For distances up to 30 meters, the 10GBASE-T SFP+ transceiver can be used with Category 6a or 7 RJ-45 UTP cables. For longer distances, the 10GBASE-SR SFP+ transceivers can be used for up to 300 meters with OM3 or up to 400 meters with OM4 multimode fiber optic (MMF) LC-LC cables. The 10GBASE-LR SFP+ transceivers can support distances up to 10 kilometers with single mode fiber optic (SMF) LC-LC cables. For extended distances, the 10GBASE-ER SFP+ transceivers can support up to 40 kilometers with SMF LC-LC cables. To increase the number of available 10 GbE ports, customers can split out four 10 GbE ports for each QSFP28 port by using QSFP+ to 4x SFP+ DAC or active optical breakout cables for distances up to 5 meters. The 40GBASE-iSR4 QSFP+ transceivers can be used for distances up to 100 meters with OM3 or up to 150 meters with OM4 MMF MPO-4xLC breakout cables. For longer distances, the 40GBASE-eSR4 transceivers can be used for up to 300 meters with OM3 or up to 400 meters with OM4 MMF MPO-4xLC breakout cables. For 25 GbE links, customers can use SFP28 ports with 25 GbE SFP28 DAC cables for distances up to 5 meters or 25 GbE SFP28 active optical cables for distances up to 20 meters. For longer distances, the 25GBASE-SR SFP28 transceivers can be used for up to 70 meters with OM3 or up to 100 meters with OM4 MMF LC-LC cables. The 25GBASE-LR SFP28 transceivers can support distances up to 10 kilometers with single mode fiber optic LC-LC cables. To increase the number of available 25 GbE ports, customers can split out four 25 GbE ports for each QSFP28 port by using QSFP28 to 4x SFP28 DAC breakout cables for distances up to 5 meters or active optical breakout cables for distances up to 20 meters. For longer distances, the 100GBASE-SR4 QSFP28 transceivers can be used for up to 70 meters with OM3 or up to 100 meters with OM4 MMF MPO-4xLC breakout cables. For 40 GbE links, customers can use QSFP28 ports with QSFP+ to QSFP+ DAC cables for distances up to 7 meters or QSFP+ to QSFP+ active optical cables for distances up to 20 meters. For longer distances, customers can use the 40GBASE QSFP+ bi-directional transceivers or 40GBASE-SR4/iSR4 QSFP+ transceivers for up to 100 meters with OM3 or up to 150 meters with OM4 MMF MPO-MPO cables. The 40GBASE-eSR4 QSFP+ transceiver can be used for distances up to 300 meters with OM3 or up to 400 meters with OM4 MMF MPO-MPO cables. The 40GBASE-LR4 QSFP+ transceiver can be used for distances up to 10 kilometers with SMF LC-LC cables. For 100 GbE links, customers can use QSFP28 ports with QSFP28 DAC cables for distances up to 5 meters or QSFP28 active optical cables for distances up to 20 meters. For longer distances, the 100GBASE-SR4 QSFP28 transceivers support distances up to 70 meters with OM3 or up to 100 meters with OM4 MMF MPO-MPO cables. The 100GBASE-LR4 QSFP28 transceiver can be used for distances up to 10 kilometers with SMF LC-LC cables. To increase the number of available 100 GbE ports, customers can group four external 25 GbE SFP28 ports (EXT1-4 or EXT5-8) into one 100 GbE port and use QSFP28 to 4x SFP28 DAC breakout cables for distances up to 5 meters or active optical breakout cables for distances up to 20 meters. For longer distances, the 25GBASE-SR SFP28 transceivers can be used for up to 70 meters with OM3 or up to 100 meters with OM4 MMF MPO-4xLC breakout cables. External SFP+/SFP28 ports are combined into two 4-port groups: EXT1-4 and EXT5-8. All external ports in the same 4-port group operate at the same speed (10 Gbps or 25 Gbps). Each external SFP28 port group can also be configured for 100 Gbps (4x 25 Gbps) operations. SPAR forms separate virtual switching contexts by segmenting the data plane of the module. Data plane traffic is not shared between SPARs on the same switch. SPAR operates as a Layer 2 broadcast network. Hosts on the same VLAN that are attached to a SPAR can communicate with each other and with the upstream switch. Hosts on the same VLAN but attached to different SPARs communicate through the upstream switch. SPAR is implemented as a dedicated VLAN with a set of internal compute node ports and a single external port or link aggregation (LAG). Multiple external ports or LAGs are not allowed in SPAR. A port can be a member of only one SPAR. In VLAN-agnostic mode (default configuration), the NE2552E transparently forwards VLAN tagged frames without filtering on the customer VLAN tag. This mode provides an end host view to the upstream network. When FCoE is used, the switch can be connected to the FCoE transit switch or FCoE gateway (FC Forwarder [FCF]) device. In VLAN-aware mode (optional configuration), the NE2552E provides more security for multi-tenant environments by extending client VLAN traffic isolation to the switch module and its external ports. VLAN-based access control lists (ACLs) can be configured on the NE2552E. When FCoE is used, the switch operates as an FCoE transit switch and it should be connected to the FCF device. Priority-Based Flow Control (PFC) (IEEE 802.1Qbb) extends 802.3x standard flow control to allow the switch to pause traffic that is based on the 802.1p priority value in each packet’s VLAN tag. The NE2552E carries a 1-year, customer-replaceable unit (CRU) limited warranty, which includes unrestricted access to software upgrades. When installed in a supported chassis, these I/O modules assume your Flex System chassis' base warranty and any warranty service upgrade. 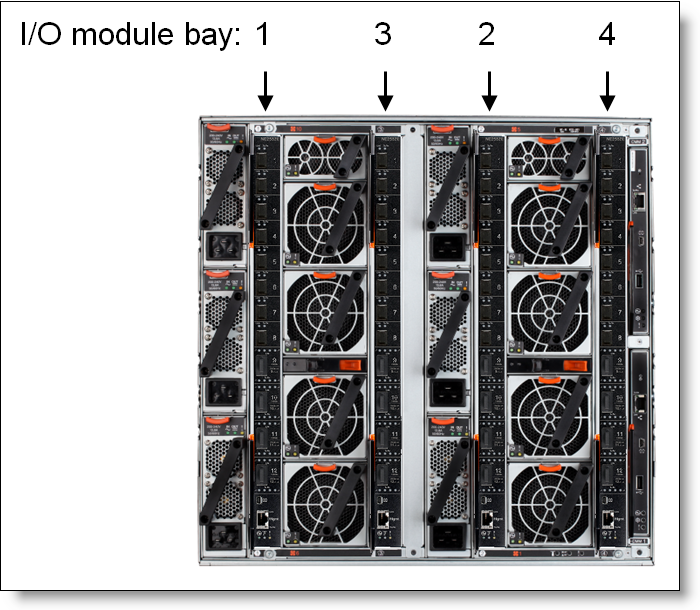 The switches are installed in I/O module bays in the rear of the Flex System Chassis, as shown in the following figure. Switches are normally installed in pairs because ports on the I/O adapters that are installed in the compute nodes are routed to two I/O bays for redundancy and performance. The NE2552E switches can be installed in bays 1, 2, 3, and 4 of the Enterprise chassis. A supported 10 GbE, 25 GbE, or 50 GbE adapter must be installed in the corresponding slot of the compute node. Each adapter can use one (10/25 GbE) or two (50 GbE) lanes to connect to the respective I/O module bay. In compute nodes that have an integrated dual-port 10 GbE network interface controller (NIC), NIC ports are routed to bays 1 and 2 with a specialized Fabric Connector, and the adapter is not required. However, the Fabric Connector can be replaced with the adapter when needed. In such a case, the integrated NIC is disabled. All internal ports in the same 4-port group operate at the same speed (10 Gbps, 25 Gbps, or 50 Gbps [2x 25 Gbps]). For 50 Gbps internal connections, two 25 Gbps ports (INTAx and INTBx) are combined into a single 50 Gbps (2x 25 Gbps) port (INTAx). Note: The switch can operate in any combination of up to three of five different port speeds supported (10 Gbps, 25 Gbps, 40 Gbps, 50 Gbps, and 100 Gbps) across all ports on the switch; a combination of four or five different port speeds is not supported. The following figure shows internal port mappings and speeds for various 4-port group configurations. The following table shows compatibility information for the NE2552E and Flex System chassis. The midplane connections between the adapters that are installed in the compute nodes to the I/O module bays in the chassis are listed in the following table. Half-wide compute nodes support up to two adapters, and full-wide compute nodes support up to four adapters. The currently available I/O adapters that are supported by the NE2552E switch are listed in the following table. * The Embedded 10 GbE or VFA adapter is built into select compute nodes. The following table lists the network switches that are offered by Lenovo that can be used with the NE2552E switch for network connectivity. The following table lists the external storage systems that are currently offered by Lenovo that can be used with the NE2552E for external NAS or iSCSI SAN storage connectivity.